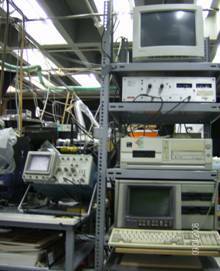 The setup consists of two synchronized pulsed lasers (an excimer and a Nd:YAG laser with SHG/THG options) with a controllable delay between the laser pulses, a vacuum chamber with a PC-driven XY table for sample(s) mounting, a gated linear diode array (1 K) (EG&G OMA III) and synchronization electronics. The plasma spectrum is transferred to the spectrometer by quartz optical fibres. The spectral sensitivity extends from 700 to 200 nm. The minimum gate delay and width is a few nsec.